Published in 1815, the Epicure’s Almanack was London’s first ‘good food guide’, describing more than 650 establishments in and around the city, and promising to direct the reader to those where he might ‘dine well, and to the best advantage’. Unlike modern directories that rely on public feedback or teams of inspectors, the Almanack was essentially the work of a single man, Ralph Rylance (1782-1834), who was paid fifty guineas by the publisher Longman to prepare the pocket-sized guidebook. 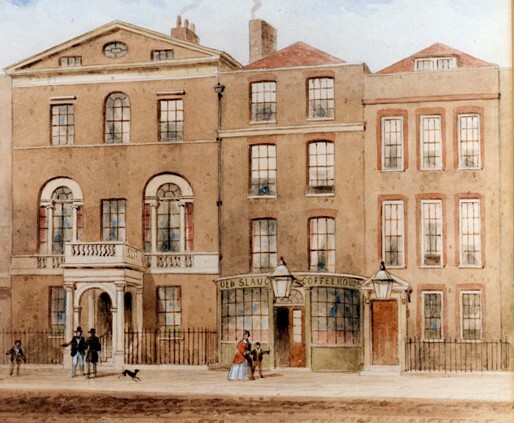 Over the course of two years he visited City chop houses, West End pastry shops, dockyard taverns, village pubs, coaching inns, and suburban tea gardens, always seeking places where the diner might ‘readily regale himself, according to the relative state of his appetite and his purse’. 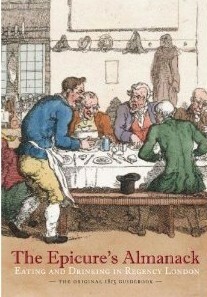 Concerned not so much with fine dining as with convenience of situation and access, speed of service, and above all value for money, Rylance often mentioned prices and especially praised establishments that offered priced bills of fare, either posted on a signboard or placed on the table. Ninepence would cover a mutton chop, vegetables, and bread at the Ship Inn near the Tower, but for the same amount of money a hungry man might instead buy three roasted potatoes, served up hot and dripping with butter, at the Dolphin Tavern not far from St Paul’s. And when no menus were available he could make his choice from the sampling of ingredients and dishes exhibited in the window or a larder near the entrance, extending at one particularly grand eatery to a number of ‘fine, lively, amiable turtle’. In addition to its brief reviews the Almanack includes chapters aimed not so much at the diner-out as the housekeeper and home cook. There is a survey of ranges, stoves, and cooking vessels, notes on the best shops for buying everything from knives to dining tables, and a list of eighteen Italian warehouses, where the keen cook could purchase herbal essences, spices, pasta, flavoured vinegars, truffles, and a host of sauces from anchovy extract to zoobditty mutch. 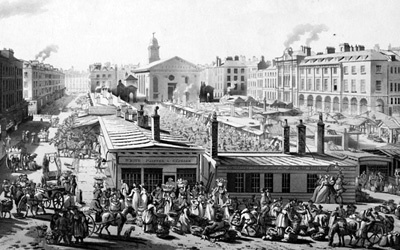 A trip through London’s markets follows, from the grandest (such as Leadenhall Market and Covent Garden) to the ‘very inferior’, with even a visit to the market in Duke’s Place that catered to London’s Jewish community. Finally, there is an ‘alimentary calendar’, a month by month guide to seasonal specialities, accompanied by notes on the proper choice of meat, poultry, game, and fish, together with comments on such miscellaneous topics as the methods of transporting mackerel and the merits of ‘barn-door’ chickens versus those fattened in coops. Longman had high hopes for the Epicure’s Almanack, issuing 750 copies and projecting an annual update. But sales were slow: the promised sequel to the first edition never appeared, and at the end of 1817 the remaining Almanacks, some 450 in all, were pulped by the publisher. Today fewer than thirty copies of the original edition can be found in rare book libraries around the world, but in 2012 the text was reprinted by the British Library, illustrated with details from a contemporary map of London and accompanied by a historical introduction and extensive notes by Janet Ing Freeman.